Particularly in older Midwestern towns and cities, it is not uncommon to find rural anachronisms in the middle of otherwise urban settings. Note that this facility is located in a residential neighborhood, where the train tracks cut through. The grain elevator was constructed in the early 1900s, as were most of the surrounding homes. 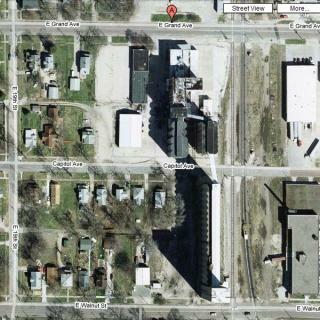 It seems reasonable to believe that employees of the feed mill were able to live nearby and walk to work.